Even though today is the first day of May, last night was May Sweeps in my house. Season 1 of Weeds has 10 episodes and Season 2 has 12, and the first season of The West Wing has 22. The planets aligned last night and I watched the season finales of both shows, each ending in a cliffhanger. The time was appropriate since the plan is to head to Savai’i this afternoon, and I won’t be able to tune into Weeds again until Sunday. So now I have two days to process all the questions I have about Nancy Botwin. I don’t think anyone on the island has Season 2 of The West Wing though, so I’m not sure what the plan is there. Last night’s suspenseful endings added stress to what is already rising tension in my life. I was just settling in to correct the short answer section of my year 11 tests, when Dan called and asked if I’d be interested in dinner. I don’t see Dan too often, and I got through all of 11.4 yesterday afternoon, so I figured why not live a little? I put down my red correcting pen and wandered down to Italiano Pizza and chatted with Dan and Erin. Dan, who lives on Savai’i is in town because the Methodist schools are organizing their midyear exams, which they administer in June. Erin, who teaches elementary school, is in the same boat as me with testing going on this week, and not much to do. Not much to do, save for the 126 tests I had sitting on my couch, feeling neglected. Erik was also out last night with a bunch of New Zealand ex-pats, and he came and sat at our table when the rest of his party left. Dan and Erin left soon after Erik sat down, but I sat and chatted with Erik for another hour. The thing with correcting the tests is I have so much more to do than that. My parents are coming in on Wednesday, and my house is a mess. I haven’t swept in at least a week, so the ant piles are growing to disturbing sizes. I haven’t washed dishes since Tuesday. I haven’t packed for Savai’i or gone to the ATM to get money for Savai’i, or called the Peace Corps to let them know I’m going to Savai’i for the evening. But there I sat, shooting the breeze with Erik. He encouraged me to come and practice piano at his music school, which I think I will do. Things wound down, and we finally left. I got home around 10:00 p.m.
Plopping down on the couch, I picked up the 11.3 exams and slid Weeds Season 2 into the DVD player. I made some progress at the outset, but the episode inevitably became more involved, and my correcting pace slowed. There’s a commentary track on the season finale, so I watched that after I finished watching the episode. Then I popped in The West Wing. There’s a commentary on that one too, so I watched that after. And after 3 hours, I had only graded 27 out of 44 year 11.3 exams. I still had 38% of 11.3 left, and 82 more year 11 exams after that. I tried forcing myself to do more, but just picking up test after test became more and more repulsive. I fell asleep on the couch, and woke up at 3:00 a.m., my fingers still curled around my red correcting pen. I moved myself to my bed. The tests smirking as I left the couch. They had defeated me. Waking up this morning was difficult, and as I passed the exam out to my year 13s, they informed me that we have Culture Day practice after the exam. I still need to blog, pack, and be ready to go by 1:30 to make sure I can catch the bus at 2:00, which takes me to the last ferry of the day, which leaves at 4:00. Will there be enough time to get everything done? Will I only give myself 2 minutes to pack? Will this post get posted? Will I make it to the ATM so I could pay my bus fare? Will the tests ever be graded? Will the floor ever be swept? Will I start practicing piano at Erik’s school more often? Tune in tomorrow to find out. Pictures below. I felt like this moment captured my life here. 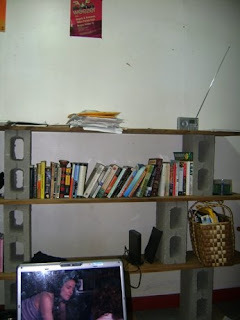 Weeds on the laptop, the cinderblock shelf, the lizard crawling across the wall, the Weezer poster up top. 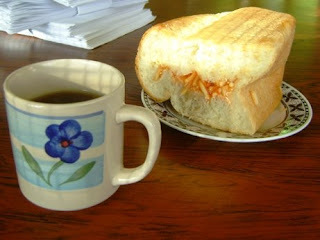 Spaghetti sandwiches like this are extremely popular here. Also popular are these pies. 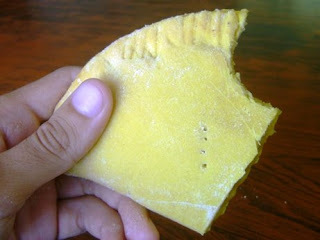 They are yellow and have a mysterious yellow custard filling, the flavor of which is ambiguous. the yellow stuff is suppose to be pineapple. Guess who just got season 2 of the west wing in the mail from Surfer Aaron? That would be me. PS. Is it weird that I communicate with you via your blog?